In Sarek there is nothing and everything. No trails, no huts, no motor vehicles, no people, no help. There are over 100 glaciers, a very alpine topography with 8 summits over 2000 meters, amazing ski touring with countless descents over 1000 meters vertical, including Sweden's longest ski run of over 1500 meters vertical, and fantastic wildlife. This is an area that requires respect. Nobody will be able to help us here if something goes wrong. You need to be fit and used to camping outdoors in the winter. We will often do ascents over 1500 meters vertical per day. 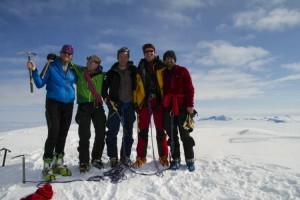 We will be crossing Sarek while ascending numerous summits and having great ski descents. We use sledges to pull our camping gear and food. 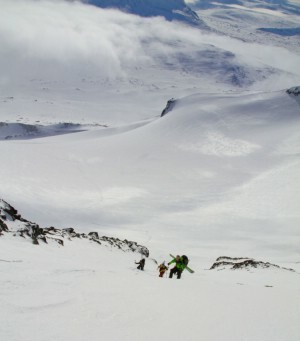 We carry daypacks with our safety equipment, food for the day and extra clothes while we ascend a summit and ski down. 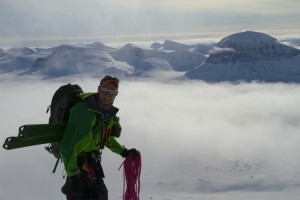 Some of the summits will involve some more technical ascents with crampons and ropes. We ski down to our basecamp to make dinner. We eat well in our basecamp tent. After that it is time to go to bed in your sleeping tents which are of the highest quality. The northern lights light up the sky. We get up early to ensure we have enough time for the day's ascent and time to enjoy a fantastic descent in great snow conditions. We keep on like this for nine days and when we are getting out of the park everybody will have a new view on life and feel stronger than ever. The itinerary will be finalized right before we enter the wild. 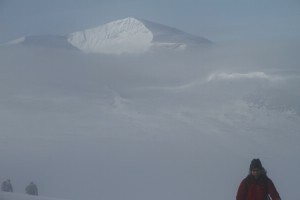 But we would aspire to leave from Saltoluokta mountain station and come out in Ritsem. 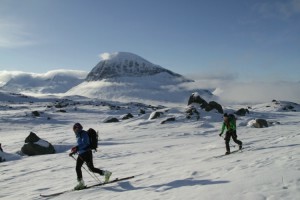 The group will ski tour with light alpine ski touring equipment and daypacks. 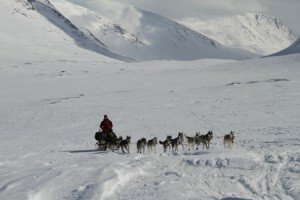 That is how we cross Sarek national park. We will summit Sarkektjokka, Sweden's highest mountain without ice, and Akka, a holy mountain – also over 2000 meters and with Sweden's longest descent, over 1500 meters vertical. • Full board including, pads and tents. • All food and cooking for the trip. • One night at Saltoluokta mountain station including a fabulous dinner. 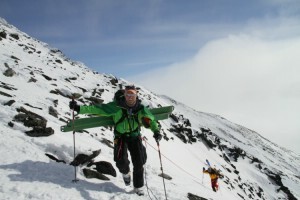 • Mountain guiding by a fully qualified IFMGA mountain guide. 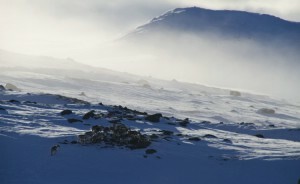 • Avalanche safety gear – transceiver, shovel and probe. • Local transport from Gällivare. • Travel to and from Gällivare (contact us we will be happy to help).